Antenna TV has just scheduled a marathon of the '90s sitcom Mad About You. The marathon will air Friday, Dec. 23, 2011 from 2pm-1am, with episodes from the final season of the hit sitcom starring Helen Hunt and Paul Reiser (a season one episode kicks it off actually at 1:30pm). This will include the one-hour series finale, "The Final Frontier." Of course the following two days on Antenna TV will be the Christmas marathon featuring all of their series, as we mentioned. So for three straight days, it's marathon mania on Antenna TV from Dec. 23-25. This Mad About You marathon was not originally scheduled and will be a treat for fans because the series is not on the regular schedule anymore. It last aired in the summer airing Mon-Thurs at 11pm & 11:30pm, but it was replaced in the fall. There is no word on if it will return to the regular schedule in January, but as of now that is not the plan. In this comedy, Paul and Jamie Buchman share their lives and offer wit and wisdom about relationships. Together, they grow and mature as they learn the art of staying married and loving it. 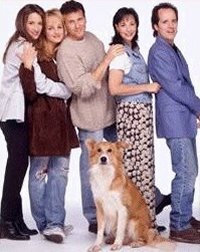 Along for the ride is their ever-tolerant dog, Murray, along with Jamie's best friend, Fran, Jamie's sister, Lisa, and Paul's cousin, Ira. Will there be any schedule changes in January? Likely no, but we will of course keep you up to date on any changes for Antenna TV, so stay with us! FX has picked up a fourth season of its comedy series The League, ordering 13 episodes. Currently airing its third season, The League is averaging series-high ratings across the board. On a first-run basis, the show is averaging 1.7 million Total Viewers and 1.5 million Adults 18-49, up +25% and +32, respectively, vs. season two. On a multi-run total basis, season two delivered 2.9 million total viewers and 2.5 million adults 18-49. This season has featured an all-star lineup of comedic guest stars including Seth Rogen, Jeff Goldblum, Sarah Silverman, Ray Liotta, Will Forte and Eliza Dushku. FX's ensemble comedy follows a group of old friends in a fantasy football league who care deeply about one another - so deeply that they use every opportunity to make each other's lives miserable. It was created by the husband-and-wife team of Jeff Schaffer (Curb Your Enthusiasm, Seinfeld) and Jackie Marcus Schaffer who serve as executive producers and directors. The ensemble cast features Mark Duplass, Stephen Rannazzisi, Nick Kroll, Paul Scheer, Katie Aselton and Jon Lajoie. The series is produced by FX Productions. There are three episodes of The League remaining in its third season. Episode 11, "The Guest Bong," airs this Thursday at 10:30PM E/P. Pete's new girlfriend wants to help him with his line up; Kevin's past at the DA's office has him running scared; Ruxin runs afoul of his company's email policies; and auto-correct gets everybody in trouble.